For procedures with complete immediate hemostasis, anticoagulation can be resumed 6-8 hours after intervention. For many interventions, full dose anticoagulation within 48-72 hours may increase bleeding complications. Cardioversion: Each of three trials of novel drugs had several hundred patients undergoing electric cardioversion on novel drugs with comparable outcome compared to warfarin. More data would be helpful, and in meantime same guidelines as with warfarin reasonable – three weeks pretreatment with ≤ 1 missed dose, TEE if concerned over high risk of thromboembolism. Continue for 4 weeks post cardioversion. Cardiac Catheterization: These are general recommendations however prior to a cardiac catheterization, the recommendations of the physician preforming the procedure which will take patient specific considerations into account, should be confirmed. EP procedures: These recommendations are a general guide however prior to an EP procedure, the recommendations of the physician performing the procedure which will take into account patient specific considerations, should be confirmed. These recommendations reflect data available at the time of this posting however recommendations will change as new data are available. Pre-procedure: 3 weeks of oral anticoagulation prior to the procedure. When 3 weeks cannot be completed, consider TEE prior to ablation. 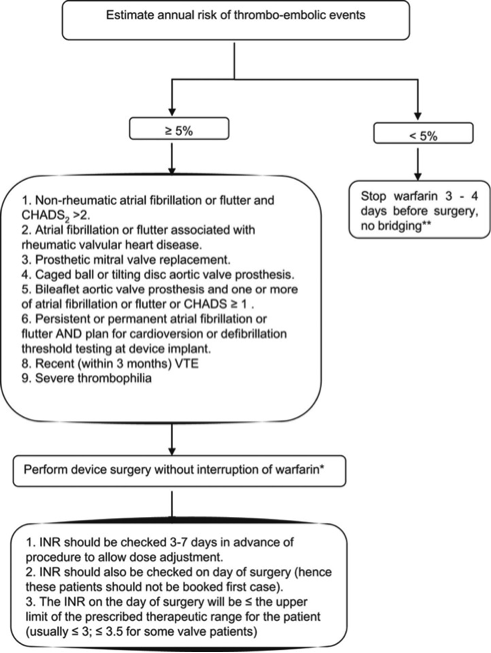 Peri-procedure: For patients taking warfarin, continuous warfarin is recommended with goal INR 2.0-3.0. For novel agents, switching the patient to warfarin is not necessary as dabigatran and rivaroxaban have been compared to warfarin in this setting with most (but not all) studies showing comparable outcomes. Until more data are available, we suggest stopping the drug 24 to 36 hours prior to the procedure depending on drug half-life and patient risk. Post-procedure: For warfarin, continuous warfarin is recommended. 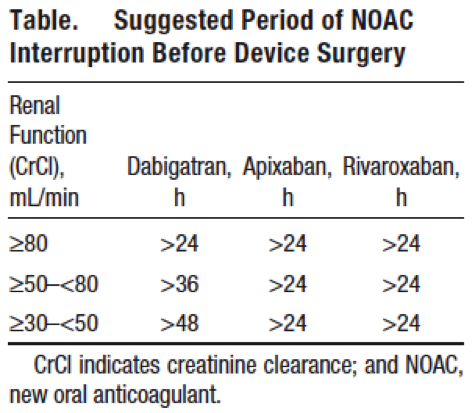 For novel anticoagulants, wait to restart for at least 6 hours after sheath removal. The time of restart will depend on complications during the procedure and the risk of the patient. Oral anticoagulation should be continued for at least 2-3 months after ablation to ensure the increased risk of embolization associated with the procedure has returned to baseline risk. Dabigatran should be discontinued for 1-2 days (CrCl ≥ 50 ml/min) or 3-5 days (CrCl < 50 ml/min) before invasive or surgical procedures. Consider longer times (>5 days) for patients undergoing major surgery, spinal puncture, or placement of a spinal or epidural catheter or port in whom complete hemostasis may be required, and CrCl < 30 ml/min. If anticoagulation must be discontinued to reduce the risk of bleeding with surgical procedures, rivaroxaban should be stopped at least 24 hours before the procedure. Rivaroxaban should be restarted after the surgical procedure as soon as adequate hemostasis has been established. The next rivaroxaban dose is not to be administered earlier than 48 hours after the removal of an epidural catheter. Medium risk procedure: stop drug 24 hours prior to procedure, have colonoscopy, and resume that night if no polypectomy and 24-48 hours after hemostasis if polypectomy.